Big Al's was located on Boulder Highway across the street from the Showboat. A fairly small grind joint that did not do all that well. Big Al also owned the Nevada Palace at the same time. The Nevada Palace was also on Boulder Highway, on the same side of the street as Big Al's, about 4 miles south. Big Al's is long gone. The Nevada Palace is also gone & has been replaced by the Eastside Cannery. I was in Big Al's the night they were closed down back in 1980. A very good friend of mine was the cage manager. He called me just after gaming left and asked me to come down. 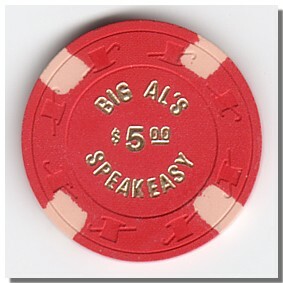 We ended up playing poker, using Big Al's chips for quite a few hours. And of course drinking Big Al's booze at the same time. I did not feel the least bit bad about that, considering that Big Al had closed down the Nevada Palace, where I was dealing poker at the time, a few months before that. None of us ever did get our last paychecks. The reason Big Al's was closed down, was because the guy who sold RV's across the street from Big Al's, had a lucky run on the craps table, and there was not enough money in the cage to pay him. Even though I was not a serious chip collector back then, I did keep a 25¢ and $1 chip as souvenirs of that night. It was not until I really got into chip collecting in 1995, that I ended up buying the $5 chip below.